Cancellations will be charged with the amount of the first night. Security deposits should be made via bank transfer in the amount of the first night at least one week prior to arrival. If you are looking for a perfect location in the center, away from noise, close to the party zone, where you wanna feel nice and cozy then you found the right place. Split Garden is a compact and newly renovated hostel in the center of the city, right behind the Croatian National Theater. We are located in a single home with our own entrance, and boast a quiet and private location, with a great view of the square and the theater. Our friendly and well traveled staff is here to answer all your questions and provide information you might need to completely use the time you have in Split.. By the way we speak English, Italian and Spanish!! 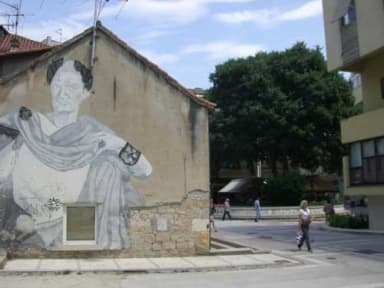 UNESCO-protected Diocletian’s palace, unique for its continuous use, is 3 minutes away on foot. We are in the close proximity to 2 laundromats, a supermarket and several ATM’s and the best ice cream place in town. If you are interested in a walk, run or a hike followed by a leisurely swim, park forest Marjan, one of the more beautiful parts of Split, is just 10 minutes away from us. Split is a unique place where people come to relax and enjoy the atmosphere while exploring the many facets of the city under Marjan. 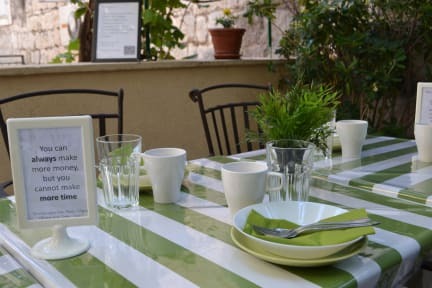 Here at Split Garden hostel, we believe that to travel is to experience life on a higher level, and we encourage our guests to get to know Split as if they were discovering a treasure: try Croatian food and drinks not readily available anywhere else in the world, maybe even spend time with the locals and learn how they approach things with gusto and relaxed attitude. And the most important you just have to try what the nightlife offers to you and we will help you with that!! All rooms have their own bathroom, lockers and air conditioning. We offer wi-fi, towels and linens free of charge. Please note that check-in is from 14:00 till 24:00 and check out before 10:00. We are open 0-24. Smoking in rooms and hallways is strictly prohibited, as is bringing alcohol in great quantities. *Don't forget to bring your student card because it gives you discount for the trips and transportation!!!! Nice for spending one night, no more. The room was very small, no all the sheets for the bed are provided, the bathroom was dirty and not comfortable. The location is very good, the staff not very kind. Ottima posizione. Stanze spartane. Armadietti piccoli. Bagno sporco e tenuto male ( niente gancio della cornetta della doccia, mentre trova posto la scatola di cartone del boiler che sta lì a prender muffa). Cucina male organizzata e decisamente poco pulita. Va bene per passarci una notte o poco più. Sicuramente uno dei più economici a Spalato. I spent a night in the hostel but the bed was destroy, I slept on the ground and at night the area is so noisy!! !